Ya beat me to the gun quatro, but yea, not too far to carry them. Cabins definitely beat the alternative! Worst case scenario: pull up in front of the cabin and remove doors, then go park. 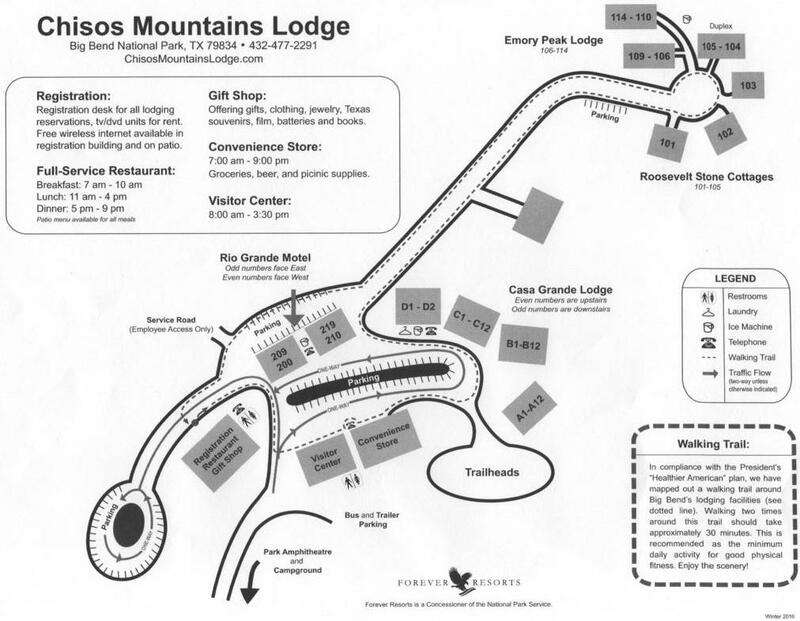 Here's the Chisos Mountains Lodge map they have at the front desk that shows the locations/names of the various lodgings. In Richard's photo above, the closest/best place to park for 101 is where the black truck is. The pathway to the door goes around the left side of the cabin to the (back) where the door is. 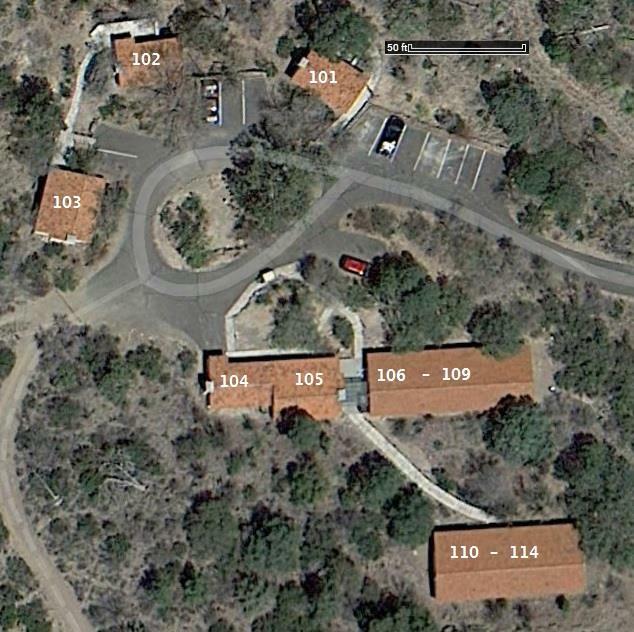 For those of you familiar with Cabins 102 and 103, the consensus seems to be that the view is better from 103, but on GE the patio area of 102 looks relatively huge and the view from there (the patio) seems to be equal? Yes? No? Does 103 even have a patio? Could someone familiar with both contrast the differences for me us? Thanks. 102 has a side view of the window and does have a very nice porch. 103 has a smaller porch on its north side (towards 103). I haven't been inside 103 but it has a dead on view of The Window. There's no shade I don't think though so on a summer stay that's something to think about. Pretty sure there is no AC in the cottages. Pretty sure there is no AC in the cottages. Thanks Quatro, that's very helpful. I was thinking of a winter visit, and the porch/patio is more important to me than the view out of the cabin window. From 103 you sit on the porch to see The Window. The porch at 103 is not as nice as the patio at 102 but the view of The Window is perfect. I've got reservations next year for 102 and 103 with friends. I plan to sit on the porch of 103 to watch the sunset and on the patio of 102 visit with my friends. FM, you can see the edge of the gigantic rock in Richard's satellite view above, where it lies between 102 and 101. If it blocks the view at all, it does so for 101 only. That big rock is pretty fun to scramble up for a great view of the Window while sitting on top. Giving a heads up to friends here on BBC that due to a family crisis, I will be cancelling my reservation to Cabin 101 (Pet Friendly) for the upcoming 3 day Memorial Day Weekend..... So check the Chisos Mountain Lodge website Tuesday morning (05/20) and you may be able to score the cabin. I am very disappointed that DH & I have to cancel. Hopefully someone here that loves Big Bend like we do will be able to make the trip and give us a great trip report. Hopefully someday in the future, someone else may give us the same break. Good luck and have a great time if you are so lucky to be heading to Big Bend soon.